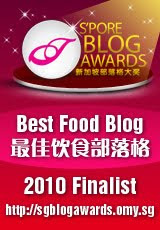 As some of you may have noticed in this blog, the right-most column is proudly wearing a Best Food Blog finalist badge. Not a winner as yet but a finalist. Start voting for An Escape to Food in the Best Food Blog category. Voting ends 30 June and I can have one vote from you every day. As voters (you need to register to log in and vote), you have a chance to win attractive prizes including a Garmin ASUS smart phone. Thank you, Singapore Blog Awards, the organizing committee, judges, and sponsors for this award event.